In today’s world only academic education does not make a student perfect to become competitive with the out side world. Internship is highly needed to gain idea, knowledge and experience. Northern UniversityBangladesh one of the reputed private universities in Bangladesh, has designed the curriculum of the MBA course such a way that the international standard graduates will be produced. After completing 63 credit hours, one student needs to go for further 3 credit hours internship program in a commercial organization. As an internship student I have got the opportunity to work with this organization for three months and acquire idea about real business world. The report has been prepared based on secondary data such as – the published company annual reports, various publications, and company documents. Some sort of primary data was collected by with the supervisor and employees of the company. My 12 weeks at the Cottonfield as an internee had been the most enjoyable time of life. Doing my internship at one of the leading factory in Bangladesh, I believe I have accumulated an experience unmatched to any other. I am extremely happy to work in such a report. Though as a student of finance and marketing it was a new situation to me, however it was totally new practical experience to me, it was very much enjoyable to me. The working environment of merchandising and administration department of the Cottonfield is conductive and friendly. The stuffs are specialized in their respective fields. Each of them works on their own and there is supervision from the top. The motivation the staff, I believe comes from the very sense of responsibility for his or her work. My overall experience had been very absorbing and I believe internship period at the Cottonfield will definitely help me a lot in building my future life. Mondol group is a vertical integrated knit garments manufacturing and exporting composite unit. The group started its business in 1991 with a small garments sewing factory. At present the group has facilities for yarn spinning, fabric knits, dyeing finishing and garments cutting sewing, finishing, packaging and exporting. 2. Mondol Yarn Dyeing Ltd.
Company Name : COTTONFIELD (BD)LTD.
100% Export Oriented Knit Garments. e) 4th Floor : Cutting Section, Mosque, Dinning Hall. Products Manufacturing : T- shirt, Polo shirt, Tank top, Vest, Trousers. Production Capacity Per Day : Polo shirt 10,000pcs Or T- shirt 20,000pcs. Fabric inspection is a major operation in the quality control process. The purpose of fabric inspection is to ensure that the fabric inspection is confirmed and the defect label is with in acceptable tolerance. uyers requirement for standard quality. Fabric type, with, different type of defects will be checked here. Minimum 10% the fabric will be checked by using 4 point method. Intermediate inspection, the standard speed of the wrapping role is 20 meter per minute. The standard lighting distance is 1 meter. Light should be displayed in 90 degree angel and view from 45 – 90 degree angel. 2.3.3 What is 4 point method? 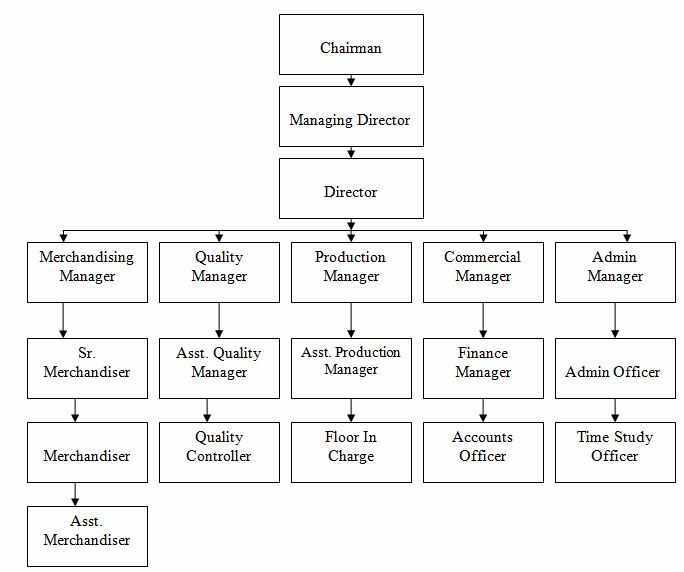 The 4 point system also called the American Apparel Manufacture Association (A.A.M.A.) point grading system for determining fabric quality. This is widely used by producers of apparel fabric. Store room is a place where we store something for safety or protection. Store is very important part in a factory. A well decorated store can give significant advantages. Two types of stores are available in the factory. Here goods arranged in color wise, fabric type wise. Five large self’s are available to store raw materials. There is no use of electric light or electricity in the store for fire protection. A weight measurement machine is available here to measure the weight of raw materials like fabric. Here goods arranged in self’s and lay in floor in carton. Cutting can be divided into two. Trial/ test cutting: The marker ratio of trial cutting should be different then bulk cutting. In trial cutting we should try to cut all sizes & minimum quantity. Bulk cutting: We should not go for bulk cutting without approval of Q.C. department & pattern correction team. Collect the order quantity along with color, size breakdown for style or P.O. Sample is the physical form of buyer specification or style or design. In other way, we can say Sample is the representation of mass production. 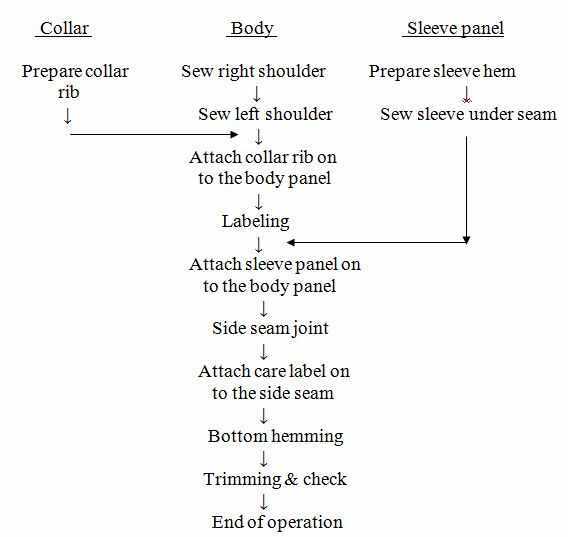 Sewing operator sew garment according operation with sewing allowance. In every sewing line has a check point where check the sewing mistake. We use different sewing method in this section. Effective sewing system combined with new planed layout and new sewing machine can give a significant advantage in many market areas. In this system, operators collect the bundle from storages and return it after completing the sewing. The sewing machine lay out is random. In this system, operators collect the bundle from racks and passes it to the next operator. The sewing machine lay out is sequence. It is very effective system in the sewing method. Each and every operators are multy skilled. This system applied for fashioned garments. In this system, operators stand to work and machine lay out in a “U” shape. A supervisor is available to help with technical information. Ironing and Finishing department is the most important department. It is the last stage of finish garment. Ironing – object of ironing is to giver the actual shape of the garments. The vendor Marketing Program of COTTONFIELD offers short term Trade Finance & Services to qualified apparel exporters in Bangladesh. 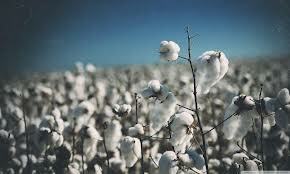 Although in the year 2007 COTTONFIELD has approved of term long facility of maximum US$ 2.5 million with a maximum tenor of three years under the program, it had proposed to hold the term loan facility till there is a clear picture of the garments export. At the beginning of a season we received Design Pack. After that we have to Quote Price, which we have provide with Sample and Open Costing formet. Next we received Order Confirmation messages from buyer with Excel chart & Confirm Sheet. After received contract sheet we have to send for generate PO sheet. At that time we will receive PO and LC. Later we have to send Fit Sample within 15 days. And later on we submit Pre Production Sample after receiving the 1st Fit Sample approval. Later we get Pre Production Sample approval, than we go to Bulk production. After Bulk production, we send Shipment Sample to Buying House. Learn about different counts of sewing threads. Check export section when goods arrived in sea port in time. Bangladesh is the 12th largest garments manufacturing nation in the world. The garments sector is divided into the textile and the readymade garments (RMG) segments. The textile segment is sub-divided into a number of activities, which include spinning, weaving, and fabric processing; and the RMG segment includes knitwear and woven items. In the year 2006 and 2007 Radiance authorized capital is higher than other factory. In 2006 Cottonfield authorized capital is lower, but in 2007 Cottonfield authorized capital hold second position with Radiance. In the year 2006 and 2007 the paid up capital of Cottonfield is only higher than Radiance. But lower than Delta and Keya. In the year 2006 total asset of Radiance is higher than others factory and in 2007 Delta total asset is higher than others factory. In the both of year 2006 and 2007 profit after tax of Delta is much higher than others factory. And in the year 2007 Cottonfield hold third position. In the both of year 2006 and 2007 fixed asset of Delta is higher than others factory. And Cottonfield hold the second position in terms of fixed asset. From the comparisons of financial of four factories, it is clear that most of cases Delta hold the top position. Cottonfield performs well in some cases. But it is clear that in all the cases Cottonfield done well from previous year. To see it’s up growing performance, it is my assumption that the Cottonfield will be the leader in the upcoming days. SWOT analysis is a strategic planning tool used to evaluate the Strength, Weaknesses, Opportunities, and Threats involved in a project or in a business venture. It involves specifying the objectives of the business venture or project and identifying the internal and external factors that are favorable and unfavorable to achieving that objectives. Internal factors – The strengths and weaknesses internal to the organization. External factors – The opportunities and threats presented by the external environment. The internal factors may be viewed as strengths or weaknesses depending upon their impact on the organizations objectives. What may represent strengths with respect to one objective may be weaknesses for another objective. The factors may include all of the 4Ps; as well as personal, finance, manufacturing capabilities, and so on. The external factors may include macroeconomic matters, technological change, legislation, and socio-cultural changes, as well as changes in the market place or competitive position. facility.Weakness – Depend on imported raw materials, lack of knowledge. savings.Threats – High price of raw materials, decrease of quota system. A group of skilled and trained human resource with national and internal expertise. A strong linkage between the all companies. Port of Chittagong is very slow in handling containers due to lack of cranes. Dependent on 100% imported raw materials and technology. Difficult to handle with always upgraded new technology. Over dependence on imported raw materials. Very higher quality product which have a good demand in international market. Market for a large portion of product is ensured within the all companies of the sister concern of Mondol Group. After full integration of the group, the administrative cost might be lower. There is a good opportunity for marketing, more production in future. Very competitive national and international market. Many new companies are coming in front with new product and new technology. Dependency of foreign countries for raw materials. National and international yarn market is always fluctuating. Cottonfield has a modern technology, efficient and dynamic management & commitment to the highest work standards. There are clear structure and accountabilities supported by well understood policies and procedures to guide the activities of the factory’s management both in its day-to-day business in the areas associated with internal control. The factory always recognizes the importance of human resource development and makes considerable investment for acquisition, development and retention of talented and dynamic professionals through its programs for trainings, allocation of responsibilities & authority, performance appraisal, job enlargement & enrichment. With the backward linkage that the woven sector does not have, knitwear is becoming a more competitive sector. With positive responses from the experts and the owners alike, the knitwear sector is likely to have more opportunities in the future, which they are likely to use to overcome the threats. However, if proper measures are not taken, it may face difficulties, like competition from India. Even a few years back India lagged behind Bangladesh in terms of the production facilities. Now, with the support from the government, the manufacturers over there are able to produce at a lower cost, compared to Bangladesh. Therefore, the knitwear sector should get adequate support measures from the government, as well make a coordinated effort to be able to fight in the global arena. As it is not up to the required standard in terms of efficiency and technological equipment, proper measures should be taken to build up the infrastructure to be able to be as competitive as possible. The knitwear holds a bright prospect.